Making video chat, voice chat or group chats through gmail chat was possible earlier too, but people used to wonder where to start it, where the options are to initiate a group chat etc. 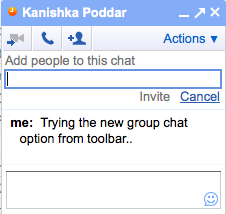 The gmail team has made it easier now, by including the options in a toolbar just right in the chat box itself. You don’t need to search deep in the chat options for anything like video call, voice call or a group chat. Just hit the + button and add people and the group chat starts there instantly. One more advantage of this is, that many people don’t have the chat plugin installed. You just need to hit the chat button, and a link for download of the plugin is sent to the other user who might not have it installed. 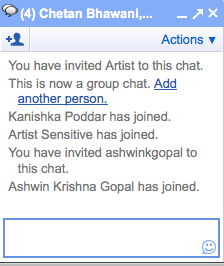 So, this also helps in getting people started with the chat options in gmail. There is also an Actions menu on the top right of the chat window, which consists of the other options like “Go off the record,” “Block”, and “Send SMS”. So, no more wondering, everything is just in front. Check this post for the details about the number of video chats happening after the availability of Video chat option through gmail.